A fad which seems unlikely to simply fade, almond milk has enjoyed a meteoric rise in popularity as of late. Because of this, many fans of this faux-dairy beverage have tried their hand at making it themselves, only to find the process a bit cumbersome and laborious. Enter the latest Kickstarter success, dubbed the Almond Cow. 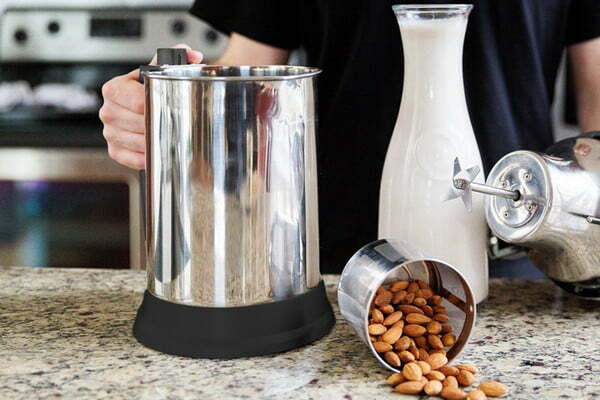 Promising freshly made almond milk in as little as 30 seconds, the creators of the Almond Cow took cues from the design of a coffee grinder to create a unique blender device capable of swiftly milking an almond. Comprised of a durable, stainless steel blade, the Almond Cow slices and blends almonds (and other hard tree nuts) in a mere matter of seconds — after soaking the almonds in water overnight, of course. Due in part to its dynamic circulation, the device also efficiently mixes water with the blended creation, nabbing all the nutrient goodness native to almonds. Once the blend finishes, owners are left with nearly 1.5 liters of fresh, ready-to-drink almond milk. Void of any additives or extras, almond milk derived from the Almond Cow is not just easy to produce but incredibly pure — while remaining harmless to the environment. For $120, Kickstarter backers can expect a package consisting of an Almond Cow device, stainless steel filter cup, a filter cup drain, and a detachable power cable. Moving forward, the creators expect to develop a detachable pitcher capable of storing excess almond milk in the fridge, an immersible head, and an automatic almond soaker for future iterations of the product. Currently, the campaign page states that initial shipments of the Almond Cow are intended to reach backers by early April, a date that’s been confirmed with the manufacturer. As of this writing, the Almond Cow had already raised more than $12,000, surpassing its initial goal of $10,000 with 18 days left in the campaign.